NASA now is targeting launch of the Parker Solar Probe no earlier than Monday, Aug. 6. Additional time was needed to evaluate the configuration of a cable clamp on the payload fairing. Teams have modified the configuration and encapsulation operations have continued. Teams also have successfully repaired a leak in the purge ground support tubing on the third stage rocket motor, which was discovered during final spacecraft processing late last week. The satellite will launch on a United Launch Alliance Delta IV Heavy rocket from Space Launch Complex 37 on Cape Canaveral Air Force Station in Florida. Parker Solar Probe will revolutionize our understanding of the Sun. The spacecraft will fly closer to the Sun’s surface than any spacecraft before it, facing brutal heat and radiation. It will be the first spacecraft to fly directly through the Sun’s corona – the part of the solar atmosphere visible during an eclipse – to answer questions about solar physics that have puzzled scientists for more than six decades. 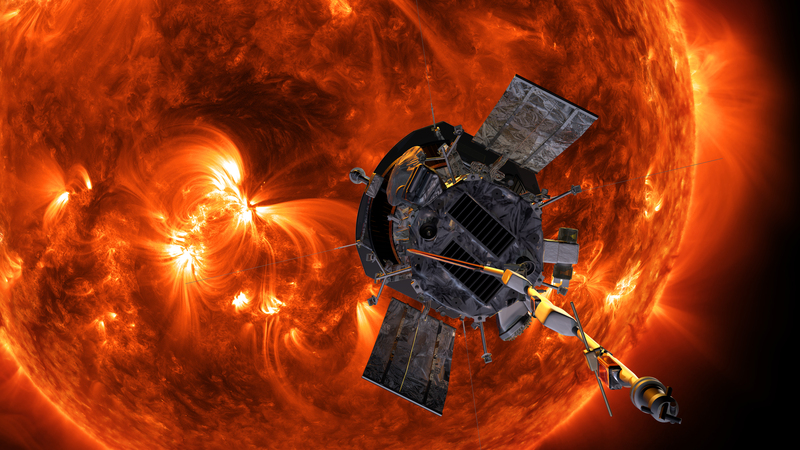 Artist’s concept of the Parker Solar Probe spacecraft approaching the sun. Launching in 2018, Parker Solar Probe will provide new data on solar activity and make critical contributions to our ability to forecast major space-weather events that impact life on Earth.